Q. Is carob better for you than chocolate? Written by Catherine Saxelby on Friday, 07 March 2014. Carob powder is definitely nutritious. It comes from the pod (seed) of the carob tree (Ceratonia siliqua), also called St. John's bread or Locust bean tree. It was mentioned in the Bible which is where the original reverence for it may have come from. The pods are large and starchy so are easy to roast and then grind into a fine powder. It's been used as a substitute for chocolate for years due to its chocolate-like flavour. Compared to cocoa powder, it contains slightly less fat and fewer kilojoules but similar levels of B vitamins. It makes a pleasant hot drink made with milk - like a hot chocolate. It's not as bitter so you can cut back on the amount of sugar you add, one advantage. Carob powder is also free of the stimulants caffeine and theobromine found in chocolate (admittedly at low levels) which may be an advantage if you're super-sensitive to caffeine or want to avoid them entirely. But then carob doesn't have the antioxidants found in dark chocolate either. However, once turned into a carob bar or a coating on a muesli bar, you'll find it contains just as much fat, sugar and kilojoules as ordinary chocolate. Compare a small 50g block of carob chocolate. It has around 15g fat and 2150 kilojoules - the same as a 50g bar of milk chocolate. The only advantage is a slightly lower sugar content (21g compared to 28g) and more fibre and potassium. While the fat in chocolate - cocoa butter - is highly saturated, many studies show that this fat does not raise blood cholesterol. With carob, any type of fat may be added but you often won't know what it is - all you'll read is "Vegetable oil" on the label. 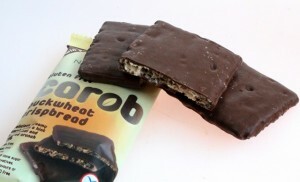 Carob coating or bars have no significant health advantage over chocolate. In fact, they're very similar. Both are rich in kilojoules, fat and sugar and should be consumed sparingly. Carob powder makes a caffeine-free substitute in drinks and in cooking - but you'd know from the taste that it was different! Caffeine – how much is too much?